OCP Contractors has been an integral part of the Ohio construction community for over 50 years. To follow stories of our community outreach, award-winning projects, office happenings and more view posts below. 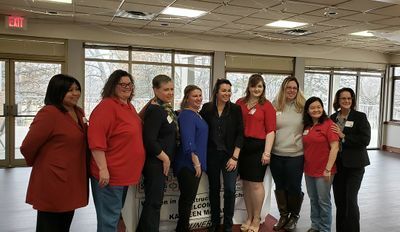 The OCP Columbus office celebrated Women In Construction week with the National Association of Women in Construction (NAWIC) Columbus Chapter at their annual luncheon. 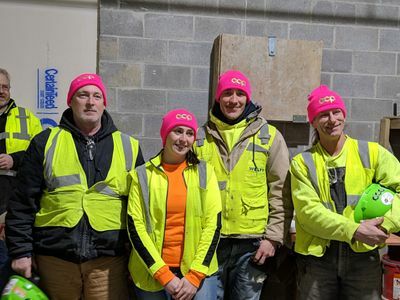 The OCP Toledo office celebrated women in construction, with the aims to highlight women as a visible component of the construction industry and to empower them personally and professionally. In celebration of Women in Construction Week, the OCP team visited with the hard-working women of the OCP skilled labor team to learn more about their work in the field and to educate others on the job site about the power of women in the construction workforce. Females comprise 47 percent of the country's workforce; however, that rate is just 9 percent in the construction industry and just under 3 percent in production roles, according to the National Association of Women in Construction. As the industry faces a skilled workforce shortage, it is imperative to actively address the lack of female talent within the construction industry. I have visited all three cities within the past month and have begun to see issues with guardrails and fall protection plans throughout the state. The issues encountered include maintenance of guardrail systems, planned use of retractable lifelines/swing fall and fall protection plans involving warning lines. Scott Staebler, Vince Stiles, and Chayna Young-Wallace. 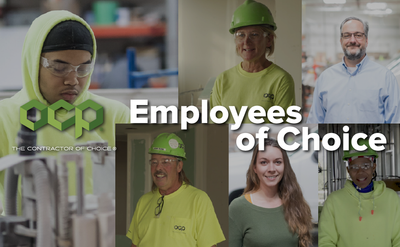 I’d like to start by telling you how much I appreciate each member of the OCP team and that I recognize we wouldn’t be where we are without the contributions made by each one of our employees. Thank you. Anthony Nail, Brodrick Parker, and Trevor Househoulder. Happy New Year, Team OCP! I hope you each enjoyed spending time with friends and loved ones over the holidays. And thank you all for making us a part of your holidays by partaking in your local office’s party (Toledo, we’re excited for next month!). Happy New Year, Team! As we’ve begun working towards 2019’s successes, we’ve been reminded of one thing, winter is officially upon us. While we love Ohio, it’s extreme winter weather conditions bring unique risks to the jobsite that it’s important to always be aware of. 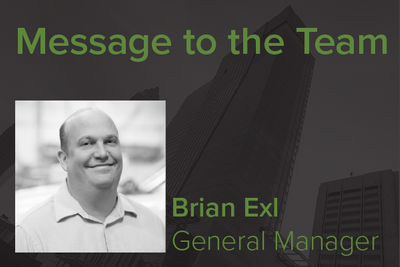 Please join us in congratulating Brian Exl on his recent appointment to General Manager of the OCP Cleveland office. 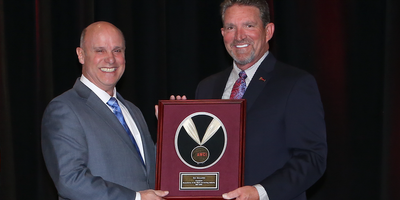 Upon completing studies at Arizona State University, Brian began working in the interior trades industry in 1998 beginning as a project engineer on the new Cleveland Browns Stadium. Brian has additionally worked as Project Manager on projects with contracts as large as $8.5 million. We had a blast celebrating the holidays with our Columbus field team. 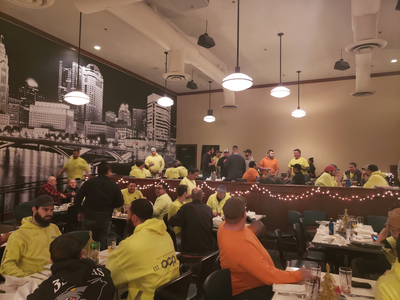 In the spirit of the holidays, the OCP team gathered great gifts in participation with the local fire department's Toys for Tots drive and enjoyed dinner, raffles and games. Thank you all for helping to make our 50th year a success. We look forward to a safe and successful 2019 with each of you! Nick Clark, Wayne Clelland, and Mike Graham. Congratulations on 43 years of hard work and success in the construction industry, Darrell! For 21 years Darrell has contributed expertise, leadership, guidance and friendship to the OCP Contractors’ team. Darrell’s willingness to assist co-workers and peers is highlighted throughout his illustrious career. For the past year, OCP’s safety committee and team have been working on developing a workable Pre-Task Analysis form. We thank the many of employees who have helped us in developing and using the Ready Sheet on projects in each city. We’re always looking for new ways to improve construction techniques to make our processes safer and more efficient. Through the use of technology, we’re able to serve our clients better and optimize workflow in the field and office. Columbus' leading publication, Columbus Business First, has featured OCP Contractors in their latest published edition. 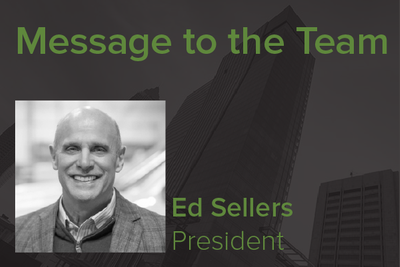 In celebration of OCP's 50 years of success, the article looks to the employees, technology, and clients that have propelled the firm towards success for 50 years. 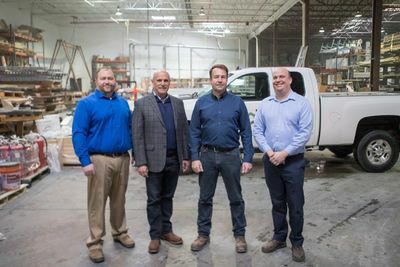 Additionally, the article highlights the history of OCP, and details the efforts that have made OCP the Contractor of Choice in Northeast Ohio. Jason Cullison, Chad Senita, and Raul Quiroga. Rob Harris, Matt Surovy, and Charles "C.J." Mercer. September is declared as Home Eye Safety Awareness Month in an effort to remind everyone of the potential hazards within the home that could damage sight. While this declared awareness month focuses on home safety, it also acts as a reminder for us to appropriately guard our eyes in the field. Here at OCP Contractors we implement processes and set goals to continually provide our clients with successful projects and our employees with an enriching, safe work environment. Each process, policy and goal are formed with one objective in mind, to continue to be the Contractor of Choice for employees and clients alike. David Gordon, Lynn Campbell, James Ladosky, and Raul Areco. 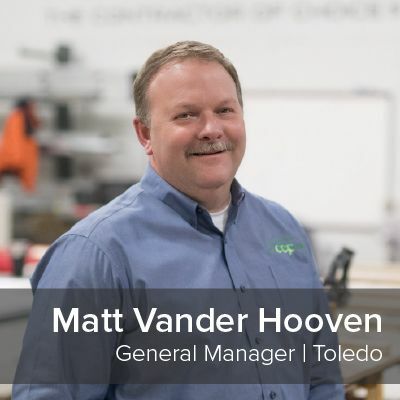 Matt Vander Hooven started at OCP in 1987 as a Co-Op Student while attending Bowling Green State University. He graduated in the Spring of 1989 from the College of Technology with a Bachelor’s Degree in Construction Management. 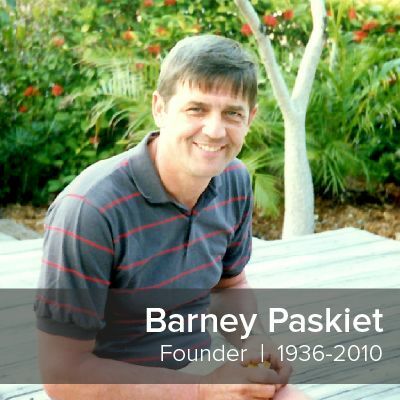 In 1968, Barney Paskiet began Ohio Ceiling and Partition Company as a small lath and plastering company in Toledo, Ohio. Barney was a lather by trade, with a thorough understanding of the construction process. 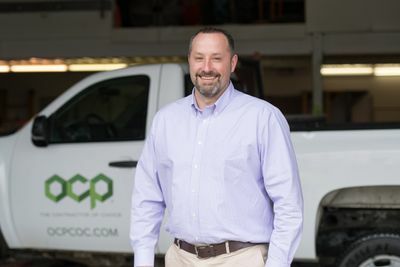 His hands-on, “get-it-done” personality, natural business instinct, and genuine love for the work are to thank for the thriving business we all recognize today as OCP Contractors. Article written by Katie Schuerger of CEA. Jeff Loyall, Executive Vice President of the Donley – Turner Team, was recently visited by two women from United Cerebral Palsy (UCP). 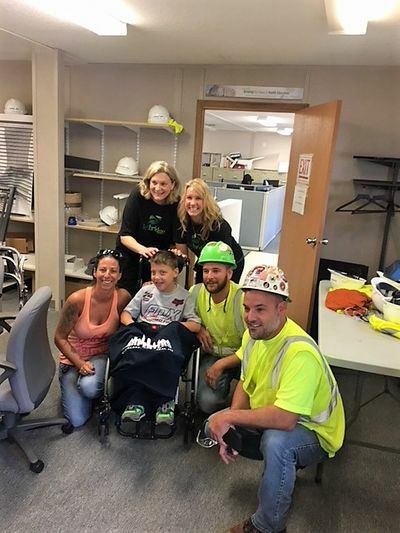 They came over to thank the construction workers for taking time to talk to one of their children that was outside the other day. They mentioned that was all he talked about the rest of that day! Article written by Victoria Idoni of WTOL. A Toledo tradesman was a guest at the White House Thursday, where President Trump signed an executive order focused on workforce development. The United Brotherhood of Carpenters presented to the president a plan to hire 50,000 carpenters nationwide over the next five years. Article written by Mark Rosenberg of the Toledo Blade. 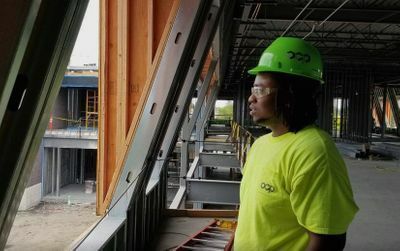 In June, 2017, Ricky Estis graduated from Whitmer High School and within weeks he was on a crew building apartments in downtown Toledo’s Fiberglas Tower. 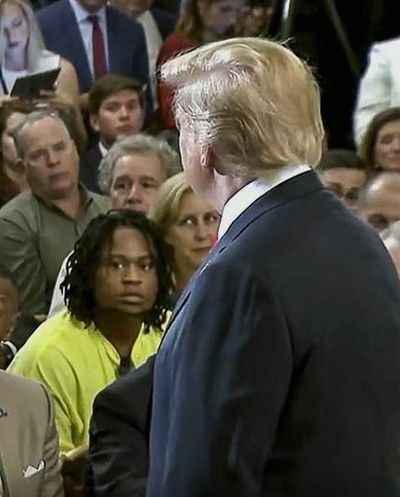 On Thursday, just over a year later, the 20-year-old Toledo resident was sitting in the White House, listening to President Donald Trump unveil an executive order on workforce development. One of the many reasons OCP has been successful for the past 50 years is that we are continually training, to further develop all of our employees and processes. It is our strong belief that our employees are our greatest asset, and that by consistently providing on the job training we are able to place each of you in a better position to thrive. 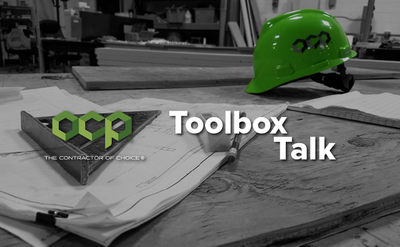 While training is at the core of OCP Contractors, I often find myself wondering if that training resonates. Recently while speaking to an OSHA On-Site representative I learned that our rigorous training does in fact resonate with the great men and women we employ in the field. James Prosser, Drew Boysel, Dan Guerra, and Tom Cramer. According to Webster’s Dictionary, quality has several meanings. It can refer to a degree of excellence or grade; a distinguishing attribute or characteristic; or an acquired skill or accomplishment. Barb Betz, Jacob Riffe and Jason Shumaker. 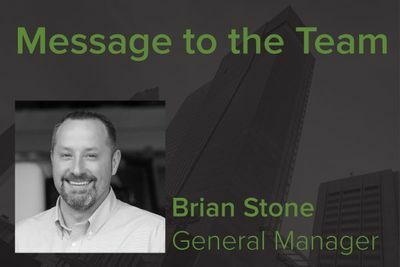 Please join us in congratulating Brian Stone on his recent promotion to General Manager of the OCP Columbus office. 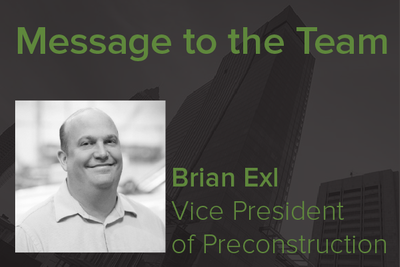 Brian has over 15 years of experience in the commercial construction industry, and has been an integral component of growth in the Columbus market. 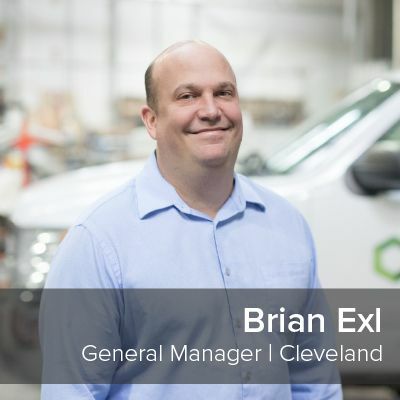 Brian will continue to drive efforts that have positioned OCP as the #ContractorofChoice in Northeast Ohio. Juan Zamarripa, Javier Marquez, Dan Smith and Mike Turi. OCP has many things to be passionate about; our high-performance culture, our safety-driven methods, our people, our means, methods, and procedures, innovation, and the buildings we build. One of my most passionate effects of OCP is the variety, size, and sheer complexity of our robust portfolio of projects. From bridge control houses to 1.5 million-square-foot convention centers and malls. In honor of our 50th Anniversary, each OCP office is dedicating 50 hours of service to give back to the communities we've been a part of for 50 years. 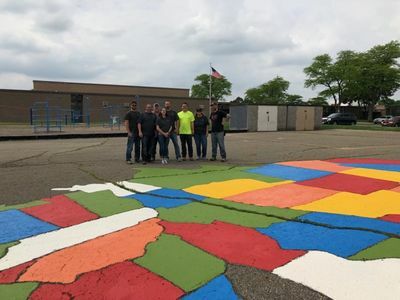 This week OCP Columbus dedicated time and materials to local elementary school, Valley View. A fresh coat of paint in the hallways and a US Map to bring learning to the playground. 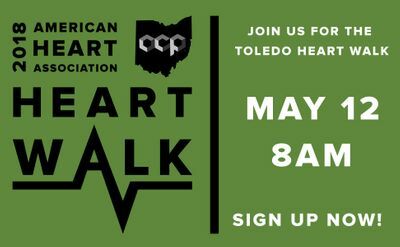 We'll walk in memory of Erica Hernandez, niece of Jenni & Kevin Harris, who passed in 2017 - her heart unable to handle the strain of her pregnancy. Heart disease and defects affect people of all ages. Bringing awareness allows for greater efforts to make improvements in areas of research. Now in the middle of the second quarter of our 50th year, I wonder where the first three months of 2018 went. 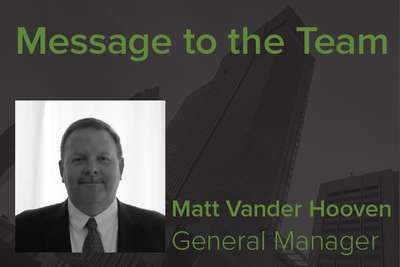 As we move forward in our fast-paced industry, there are exciting things happening in our Toledo office! 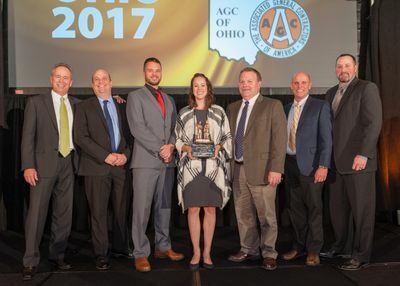 We are starting to see the results of the emphasis placed on efficient Project Management; with thanks to the efforts of Craig Paskiet, Dan Bartolet, Chris Gunderman, and our part time student intern, Haley Theus. 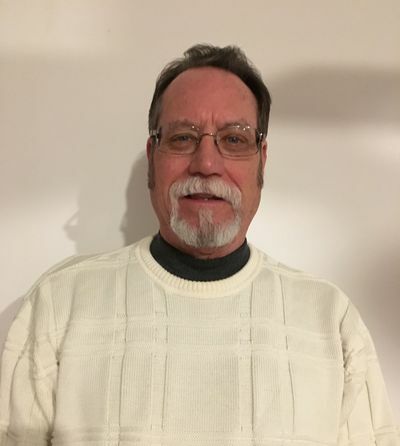 Carl W. Fausze, an OCP Foreman since 2010, has been in the Carpenters Union for 14 years. He is known for his wisdom and creativity in keeping his projects cost effective, working on mid to large sized projects. A man of few words, he gets the job done without complaint. 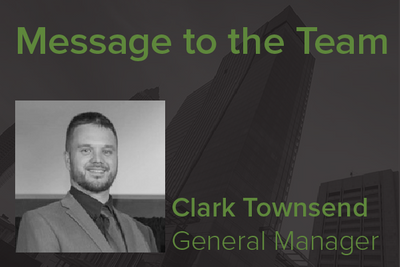 Carl keeps a professional attitude and is highly respected by our GC clients. 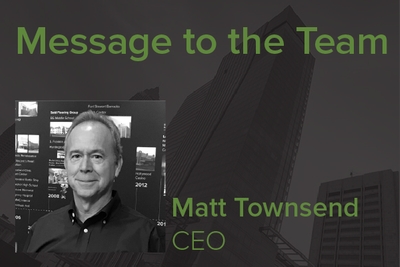 Diversity is a part of OCP’s culture, and continually drives the company forward. This month as we celebrated Women In Construction Week we were reminded of the many people that come together to make projects successful. I want to personally take the time to thank the women of OCP whose hard work is one of the reasons we have become the Contractor of Choice throughout Northeast Ohio. 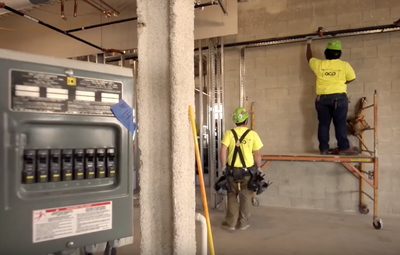 OCP Contractors has always put safety at the forefront, whether it’s on or off the job sites. In line with our safety values, OCP has set up an Employee Assistance Program (EAP) through Megellan Healthcare. Of the many facets OCP attributes its success to, this month we focus on the diversity that has driven the culture and success of the firm. Diversity in gender, race, and age means that OCP can utilize the ideas of many to cultivate a bigger variety of voices in the working environment, and most importantly, a culture of equality. Of the over 10 million workers that make up the United States’ construction industry, only 9.1% of the workforce consists of women. 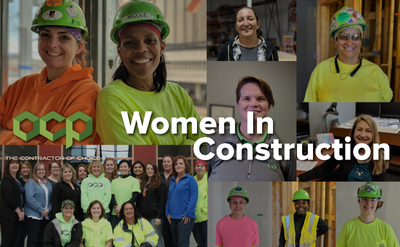 Whether working in trades, administration, general contracting, subcontracting, or other professional services, these women are vital to the construction process. Cleveland's leading publication in the construction space, Properties Magazine, has featured OCP Contractors in their latest edition. 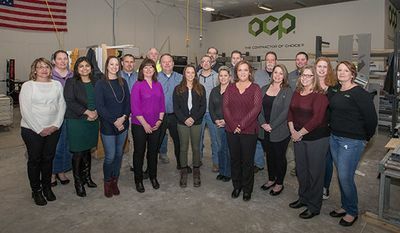 In celebration of OCP's 50 years of success, the article looks to the employees, technology, and clients that have propelled the firm towards success. 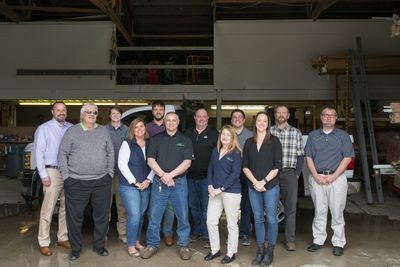 Additionally, the article highlights the history of OCP, and details the efforts that have made OCP the Contractor of Choice in Northeast Ohio. As we celebrate 50 years of success, we reflect on the goals we have been able to accomplish as a part of this significant milestone. Of the many things we contribute our success to, this month we focus on teamwork. Anthony Corrado, a 310 laborer with OCP since 2012, was quickly promoted to laborer foreman due to his exceptional work ethic and leadership qualities. Anthony has been laborer foreman on several high profile projects such as the Aloft Hotel, CSU The Edge and Centric Apartments. 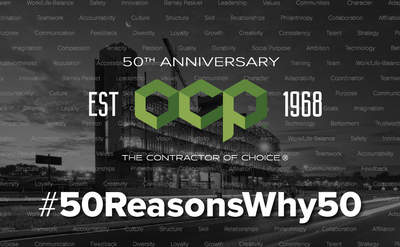 An exciting new year is upon us in 2018, OCP is celebrating 50 years in business! This is a major milestone in our history. 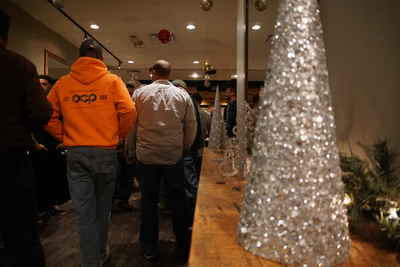 Thank you to all of our employees for making OCP a success. Logan Spohn, a 4th year apprentice, has been with OCP since 2015. As a foreman on the Beatty Building, a $5M+ project, he continually accepts responsibility assisting in layout and framing. His knowledge and management style are cornerstones to his professional development. The new year is starting quickly. Many contractors have their strategic plans in place for work in progress and sales goals set for 2018. There is optimism in most markets. If we can achieve the margins we want, it should be good year—unless we have “that job,” the one we wish we didn’t have. It’s time to start fresh; a new year is upon us. There is a different feeling in the air. Opportunities abound as I, your association’s president, can attest after attending a number of AWCI-related events and gatherings since my term began in the summer. The AC Hotel by Marriott is a premier hotel designed to be the featured cornerstone of the Bridge Park Development in Dublin, Ohio. The hotel will be the hub for entertainment and local flare within the development. The 8-story hotel’s unique design features floor to ceiling windows, and a rooftop bar with a spectacular view of the Scioto River and surrounding area. Here at OCP Contractors, our membership in AWCI is defined as "contractor at-large." That is because Ohio does not have a local chapter, as many regions do, nor does the state have a chapter executive. Zach Kraut started his career with OCP in 2005 as a First Year Apprentice, working his way up to foreman. He is proactive, organized, and a good communicator. Zach looks for more productive ways to complete a task. His professionalism has earned him a reputation with GC's of quality and timeliness. AWCI held its Industry Executives’ Conference & Committee Meetings in Tucson, Ariz., last month, and there were a number of seminars, committee meetings and discussions that significantly impact AWCI members and the entire industry. One of those is the recent launch of the rule regarding respirable crystalline silica from the Occupational Safety and Health Administration. Josh Henning exudes a positive attitude and strong work ethic that manifest in any task he performs. Josh's ability to perform work safely, while maintaining productivity is exemplary. I am writing this on September 11, the anniversary of that catastrophic day in our nation’s history 16 years ago. Many people just refer to the event simply as 9/11. Many died, and our first responders ran to aid the injured—even at the risk of their own lives. I am humbled by the memories of what occurred on that day. Our nation and our lives changed dramatically. Chris Hawk, a painter with OCP for over 6 years, was very instrumental in completing the ProMedica Steam Plant in Toledo, a difficult project start to finish. He maintained the aggressive schedule with a small crew of four for 95% of the project. Chris's strengths are his patience & dedication to his work. Dan Bradford, a Cleveland Carpenter, for over 11 years of dependability and solid work ethic. His contagious enthusiasm brings energy to the crew and his personal commitment to quality is obvious in his work. Opt-in for the latest on completed projects, recent company news, and upcoming events.